Today I found two commercial messages in my e-mail. The 2 big Pinoy airlines want to sell their seats. Before I comment, have a look at the pictures. Below is the proof that a full declaration of all fees and taxes can win new customers and satisfy existing ones. 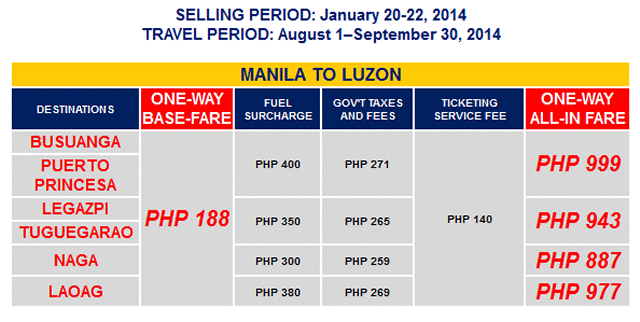 Philippine Airlines fully declares all fees and taxes that will be added to the base fare. In most European countries the airline have been forced by law to advertise the fares the passenger really has to pay. I think these laws are not needed. Travelers get more and more mature and have learned to read advertisements. The comparison of the two ads above explain, what I mean. And the European carriers found a trick, so they still can advertise extremely low fares. About 5 to 20 percent of the seats are discounted. The remaining 80 to 95 percent are not standard price, but a bit more expensive to compensate the loss encountered with the discounted ones. In the advertisement they now offer “FROM fares” or “Book fast, seats are limited”. And yes, of course, all Pinoy carriers use these trick also.